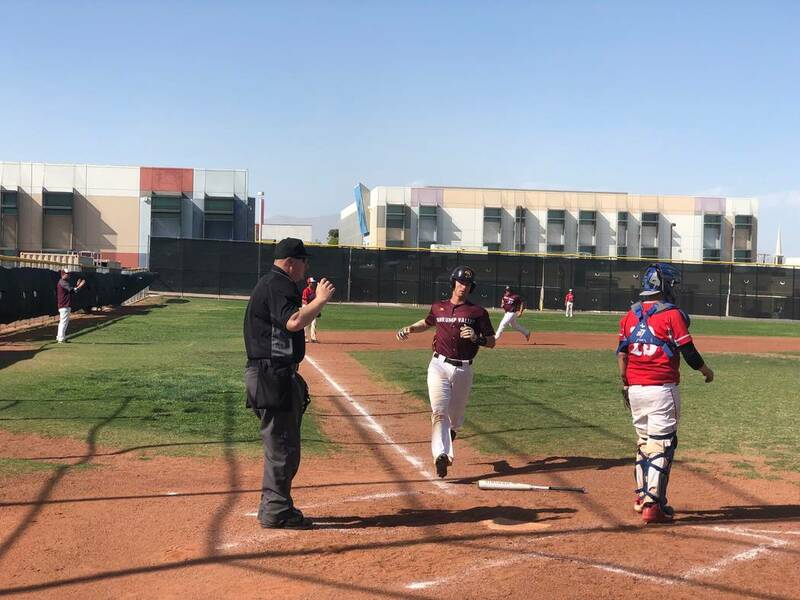 Roughly halfway through the season, Pahrump Valley High School baseball coach Brian Hayes has plenty of reasons to be pleased with his team. Tom Rysinski/Pahrump Valley Times Senior catcher Willie Lucas crosses the plate with one of seven first-inning runs Tuesday during Pahrump Valley's 20-2 rout of Western in Las Vegas. 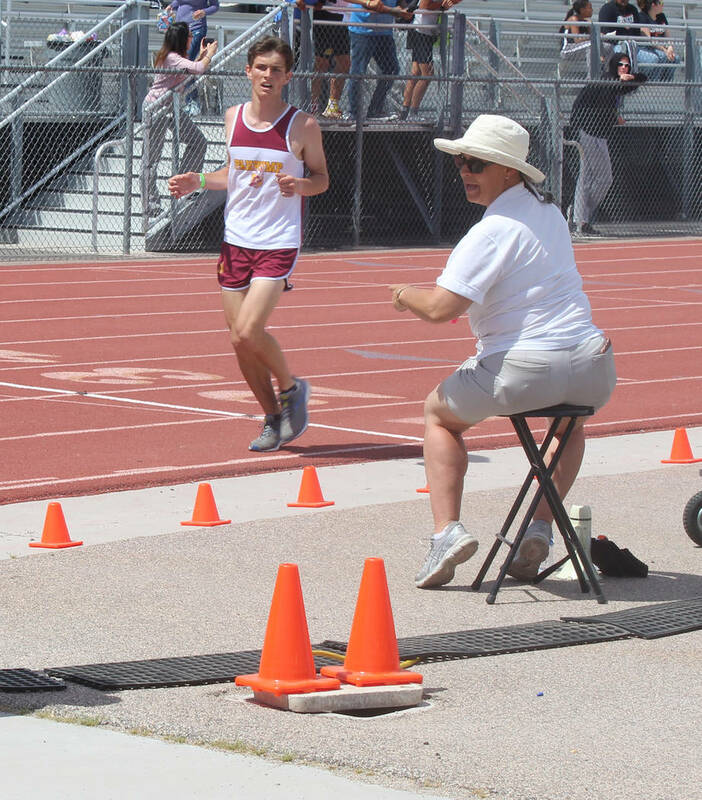 Tom Rysinski/Pahrump Valley Times Pahrump Valley junior Michael Sonerholm crosses the finish line after setting a personal record of 10 minutes, 48.16 seconds in the 3,200 meters Saturday during the Dragon Invitational at Del Sol Academy in Las Vegas. 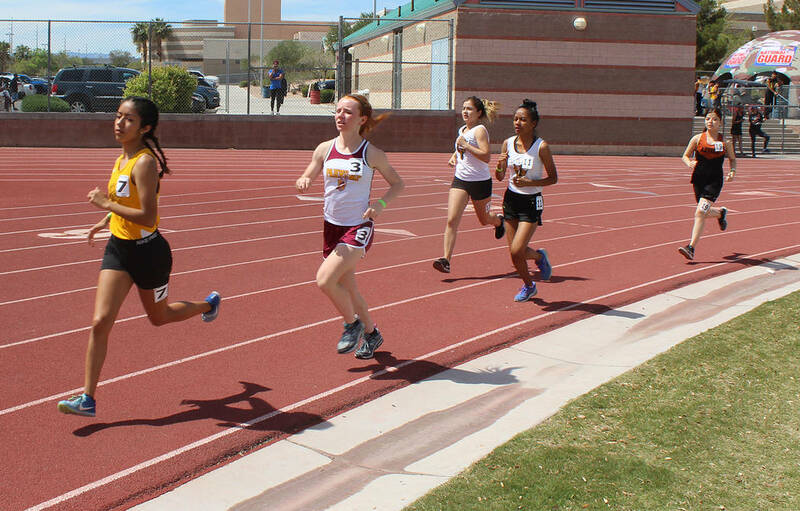 Tom Rysinski/Pahrump Valley Times Sophomore Makayla Gent, second from left, gets off to a strong start for Pahrump Valley in the 3,200-meter race Saturday at Del Sol Academy in Las Vegas. Gent finished fourth in the race in 13 minutes, 26.66 seconds. Tom Rysinski/Pahrump Valley Times Pahrump Valley junior Angela Zeigler uncorks a heave of 29 feet, .5 inches to finish 13th in the shot put Saturday at the Dragon Invitational in Las Vegas. It’s not so much the record — 11-6 overall, 4-1 in the Sunset League — as much as it is seeing some players step up on the one hand and winning games while other players have not yet hit their stride on the other. “As of now, I would say the two biggest bright spots have been our middle infield, shortstop Chase McDaniel and second baseman Joey Koenig. In addition to playing solid defense up the middle, they have accounted for 42 of our 137 runs. Senior transfer Reace Millette has been an outstanding addition. Millette leads the team with a .577 batting average and is fourth in hits despite playing only 10 games. Hayes added that Millette can do a lot of damage on the bases and is versatile defensively, playing second, short, third and all three outfield spots for the Trojans. “Another bright spot for us is sophomore outfielder Jalen Denton,” Hayes said. Denton is second on the team with a .526 batting average and “can do a little bit of everything — hit, run, throw and defend,” the coach added. The biggest hole the Trojans had to fill this season, innings from their pitching staff, largely has been filled by junior Cyle Havel. The closer-turned-starter has four of the 11 victories and is pitching to a 1.33 ERA in 21 innings, striking out 29 and walking eight. Koenig is helping fill Havel’s old role out of the bullpen, and Hayes calls him “our guy to go to in relief in pressure situations.” Koenig has not allowed an earned run in 16 innings, and opponents have an on-base percentage of just .254 against him. “Jake Riding has looked good as our number three, and we are hoping to see a few of our younger guys take advantage of opportunities in the future,” Hayes said. Riding, a sophomore, is 3-0 with a 1.08 ERA, allowing 8 hits in 13 innings. Team leaders include McDaniel in hits (25), Willie Lucas in doubles (6), Koenig in triples (3) and stolen bases (10) and Denton in on-base percentage (.648) and slugging (.815). Koenig also has Pahrump Valley’s only save. While only two of the five Sunset League games have been competitive — the Trojans won the other three by an average of 16 runs — the schedule does provide some upcoming tests. “We will be playing some solid baseball teams in the next two weeks in the Durango Tournament and the Coachella Tournament in California, which will give us a good idea of where we stand before playoffs,” Hayes said. 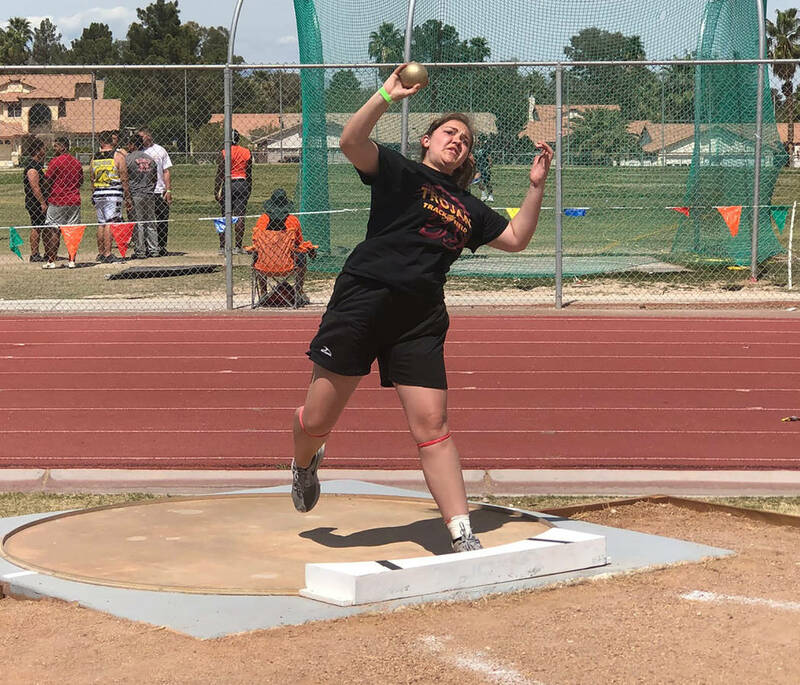 Pahrump Valley track and field athletes posted 10 personal records and six season records on Saturday at the Dragon Invitational at Del Sol Academy in Las Vegas. Leading the way was junior distance runner Michael Sonerholm, who placed fourth in both the 1,600 meters (a season-best 4 minutes, 46.36 seconds) and 3,200 (a PR of 10:48.16). Both were good for fourth-place finishes in a meet that included 10 Class 4A schools. Sonerholm finished fourth in the 1,600 at last year’s Class 3A Southern Regional meet, and his time Saturday was only 2.5 seconds slower than that effort and more than 8 seconds faster than his previous best this season. “The last few races I’ve been hanging out in the back and slowly moving up, but for this race I felt like I got out good and really finished strong,” Sonerholm said. Senior Ethan Whittle cleared 5 feet, 10 inches, his season high, to finish third in the high jump, an event won by teammate Chance Farnsworth at 6-0. Dee Brown’s 35-10 in the triple jump was a personal record good for 18th place, while sophomore Bodhi Ledford’s 85-7 in the discus was also a PR. Back on the track, sophomore Garret Hopper finished 20th in the 100 with a season-best 12.06 and set a PR in the 200 with his 22nd-place 24.45. Brown placed 21st in the 400 in a personal-best 56.94. On the girls side, sophomore Makayla Gent finished fourth in the 3,200 (13:26.66) and fifth in the 800 (2:41.29). Freshman Georgina Avent took fourth in the 100 hurdles in 17.82, her best time. Classmate Patricia Roundy scored a PR with her 1,600 time of 6:24.02. Kate Goodman’s 3:05.02 in the 800 was good for 18th and a season-best time for the senior. The Trojans scored a handful of top-10 finishes in the field events, including two each in the shot put and pole vault. In the shot, junior Kylie Stritenberger threw a PR of 32-7 to finish seventh, while junior Destany Korschinowski’s 30-2 placed seventh. Sophomore Taylor Williamson finished fifth in the pole vault, clearing 7-6, while junior Romilyn Carreon cleared a season-best 7-0 for sixth. Freshman Tayla Wombaker placed seventh in the high jump (4-4) and ninth in the triple jump (29-1), while sophomore Kaylyn Duncan PR’d in the high jump at 4-0.